I am done with the base of the green and black overskirt, and am about ready to start making and attaching the floral appliques to my Lady Tremaine traveling outfit. 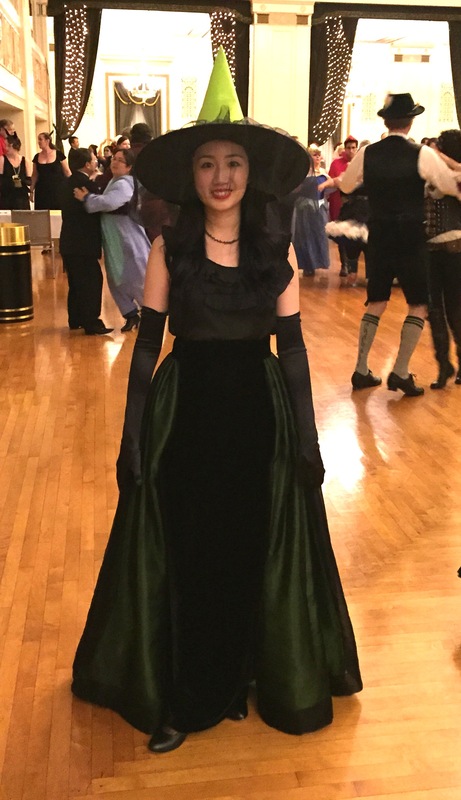 Last night I wore the skirt (and the velvet underskirt from Part 2) with a matching green and black witch hat and veil to the Gaskell Halloween Ball. 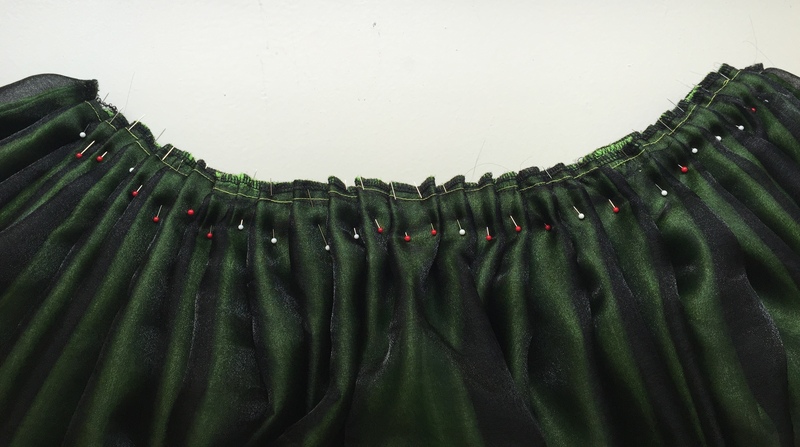 The waistband is velvet with heavy interfacing inside, to blend in with the velvet underskirt. The waistband closes with hooks and eyes on the side of the skirt near one hip. I waffled back and forth between knife and cartridge pleats a few times. At first I intended to knife-pleat, since the movie skirt appears to have simple pleats. However, when I started that I realized my fabric was so bulky it was better to cartridge pleat. Then when considering cartridge-pleating 4 yards of 4 layers of fabric into a 14-inch area, I started thinking “Gee, I wish I used taffeta instead!” (Taffeta is so much thinner than the 2 layers of satin I’m using, but I decided to go with satin because I wanted a heavier drape and liquid-like flow, like the satin of Lady Tremaine’s ballgown, shown below). In the end, I had to use knife-pleats, even though my waistband was a little bulky, because the skirt would have been much too short if I folded over the top edge to allow for cartridge-pleating. For practical reasons my skirt is shorter than the movie version. I will be roaming around Costume College next year in this dress, and don’t want to trip because I am clumsy. Plus, trains get terribly dirty, and I can’t do a dust ruffle because it would show in the front. 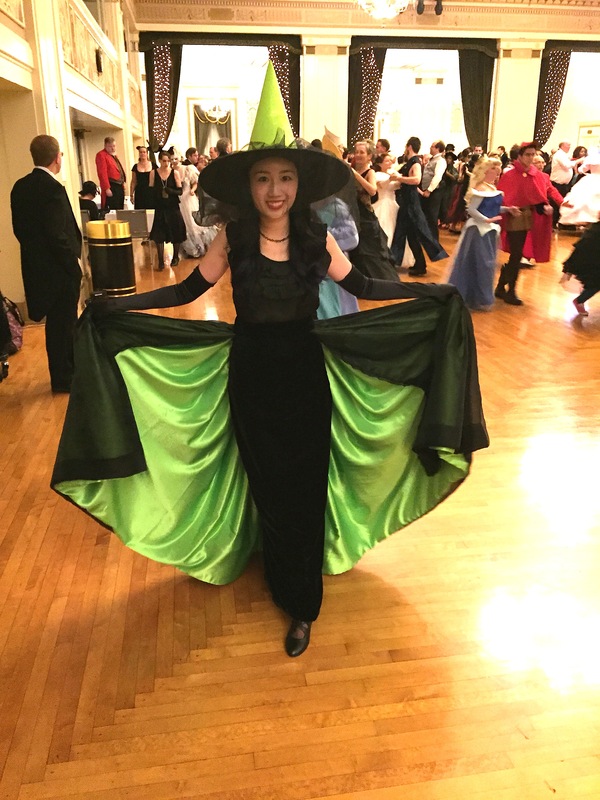 I am glad I made the choice to make a shorter skirt, because I was able to dance in this outfit. 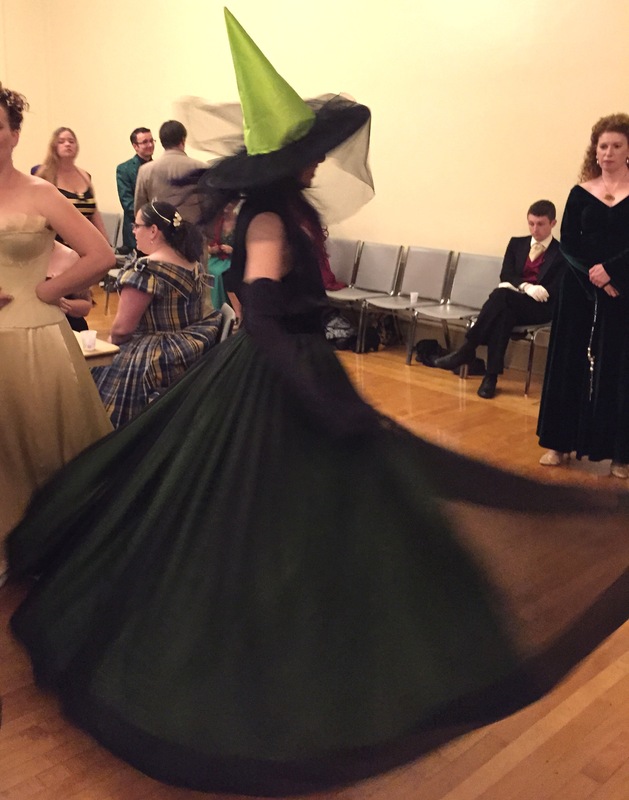 I loved the way the skirt swirled when I spun! 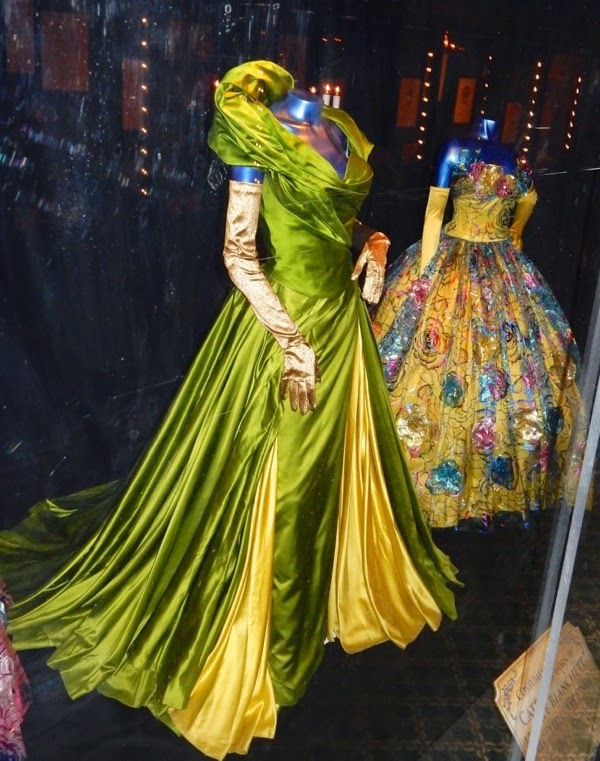 Posted in Lady Tremaine and tagged costume, Disney, Lady Tremaine, sewing. Bookmark the permalink.